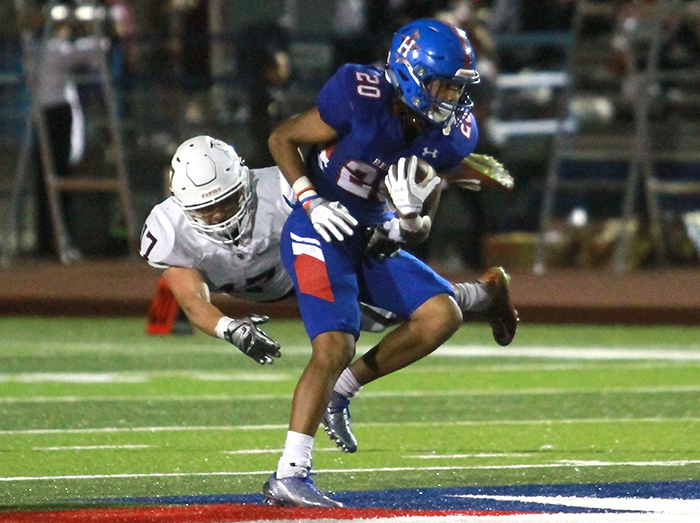 An interception in the end zone by senior cornerback Ryland Kinard sealed a 21-17 win for the Dripping Springs Tigers (3-0) Friday as they spoiled the Hays Rebels’ (1-2) homecoming in heartbreaking fashion. 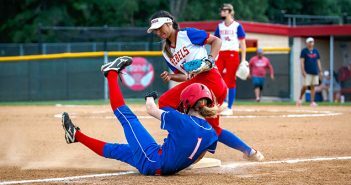 The Rebels opened the game with strong play on defense, along with the adept rushing attack of junior quarterback Xavier Martinez on offense. An 11 play, 75-yard opening drive by Hays was capped off with a 7-yard rushing touchdown from Martinez, who finished the first half with 55 yards rushing on 6 carries. 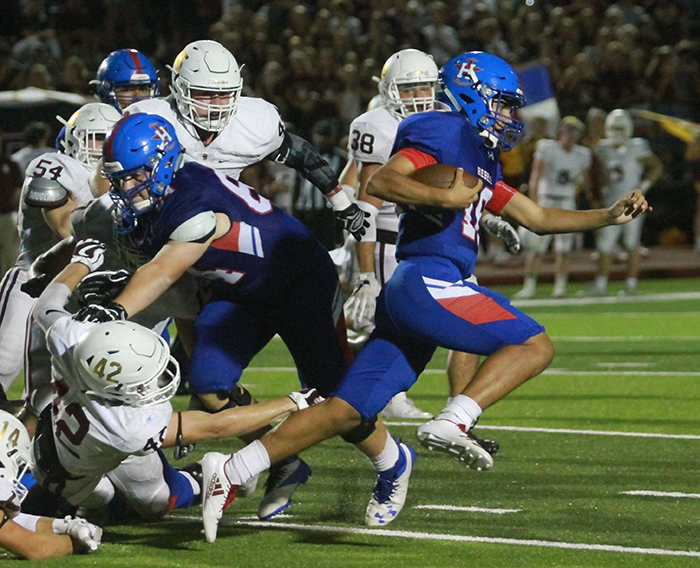 After a 26-yard Rebel field goal in the second quarter, Dripping Springs responded with a 1-yard rushing touchdown from junior running back Jake Cox. Cox led the Tigers with 15 rushes for 82 yards and had 1 touchdown. 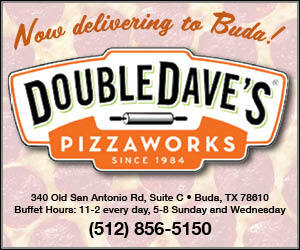 The late second quarter score by Dripping Springs turned the tide. The Tigers maintained momentum by scoring the only points of the third quarter on a 1-yard rushing touchdown from senior quarterback Trevor Greenman. 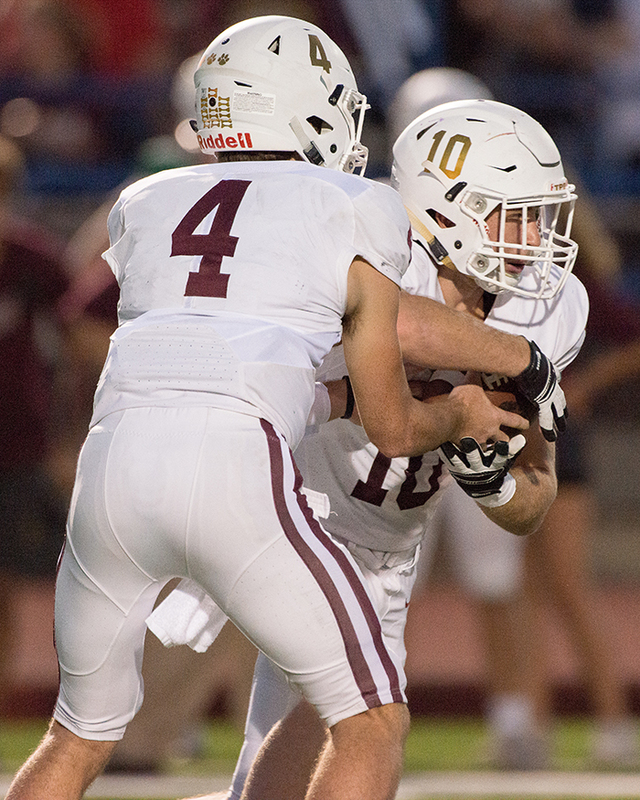 Dripping Springs Tigers senior quarterback Trevor Greenman (4) hands the ball off to junior running back Jake Cox Friday. Photo by Gwoko Photography. However, Greenman silenced the Rebel crowd with a 50-yard touchdown pass to junior wide receiver Parker Alford with only four minutes left in the game. 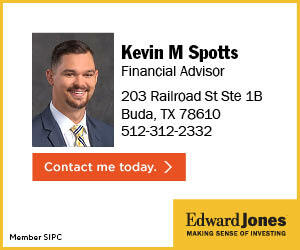 Martinez led Hays on a last minute drive to the Tigers 3-yard line, but Kinard intercepted a pass in the end zone with only :22 seconds remaining in the game. Hays travels to play San Antonio Reagan at Northeast ISD stadium next week, while Dripping Springs hosts Kerrville Tivy at Tiger Stadium.